Spring has sprung and Ruby’s Diner is helping you enjoy the fresh air with our shake of the month, The Cherries Jubilee Shake! You won’t want to miss this creamy vanilla ice cream shake blended with cherry flavors, and of course topped with whipped cream and a cherry! This refreshing treat will be available from April 1st 2019 – April 30th 2019. Shooby Dooby down to Ruby’s to try it before it’s gone! The Cherries Jubilee Shake will be available from April 1st, 2019 – April 30th, 2019 at participating locations. 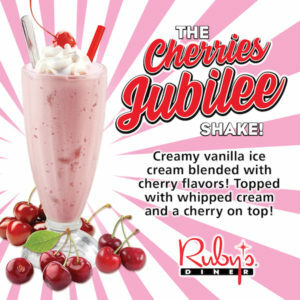 Please give your local Ruby’s Diner a call to see if the Cherries Jubilee Shake is available near you! The Shake of the Month limited time offer excludes casino, airport, sporting venue & food court locations. To see a list of all of Ruby’s Diner locations, please click here. Want to see what other special limited time offers Ruby’s Diner has in store for our guests? Click here for more Ruby News!